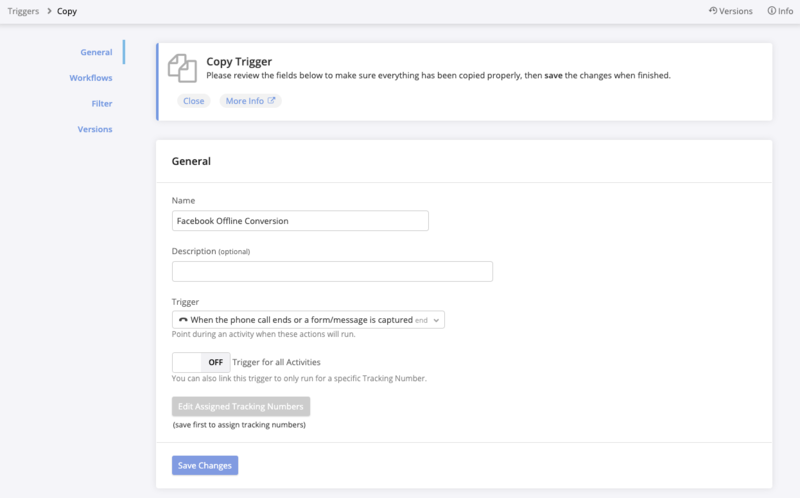 Copying Settings enables you to quickly clone records or bulk apply settings to other records. Some features have a “copy to” option that will create a clone of the record you’re currently working on, which can be saved to the current account or to another account in your agency. Open any of the record types listed above. In the General section at the top of the page, find the Copy to button located next to the Save Changes button. Click Copy to, then select this account or other account. You can only copy records to one other account at a time. If you need to copy this record to multiple other accounts, you will need to repeat this process for each account. You may wish to save this record as a preset to save time in the future when you create new accounts. On the next page, review the settings to make sure everything you’re copying looks correct. The “copy section” option allows you to apply the settings for the section you’re editing to another record of the same type in your account. “Copy section” copies only one section of settings to other records. If you wish to copy more sections of a record, you will need to repeat this action for each section on the page, or you may with to use “copy to” to clone the record instead, if possible. 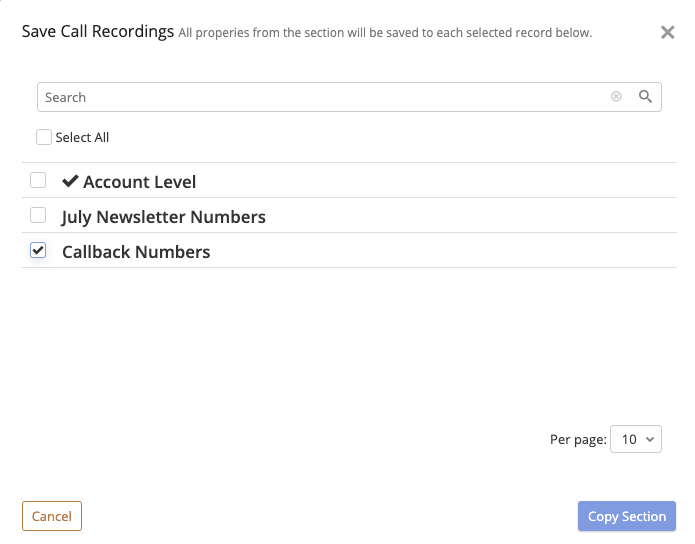 The “copy section” option will overwrite the existing settings of the records you select. Open any of the record types listed above and click or scroll to the section of the settings you wish to copy. Click Copy Section (found next to the Save Changes button). In the pop-up that appears, choose the records you wish to apply this section of settings to. Remember, only the single section you have selected will be applied to the selected records (such as the No Answer section of a call queue). The settings will overwrite the section of settings on the record you select. The entire section you have selected will be applied. 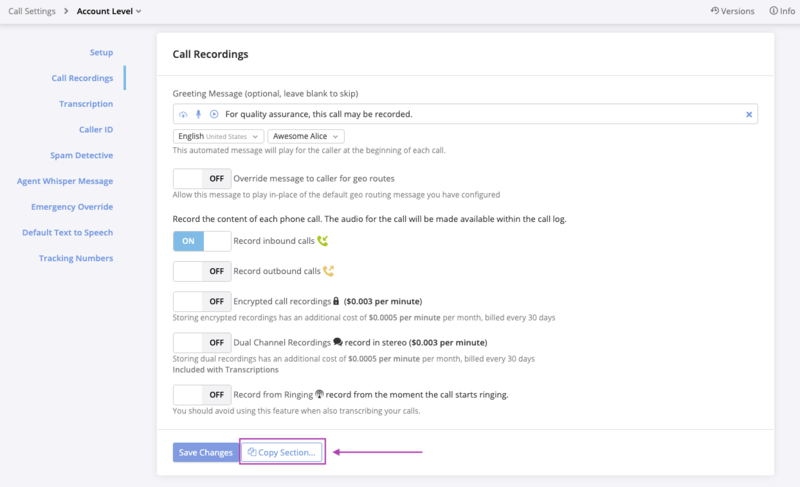 If you are copying a greeting message to other call settings in your account, for example, the options for call recordings will also be applied to the records you select. A confirmation will appear. Review the message to make sure you have selected the correct records, then click OK to apply the changes.